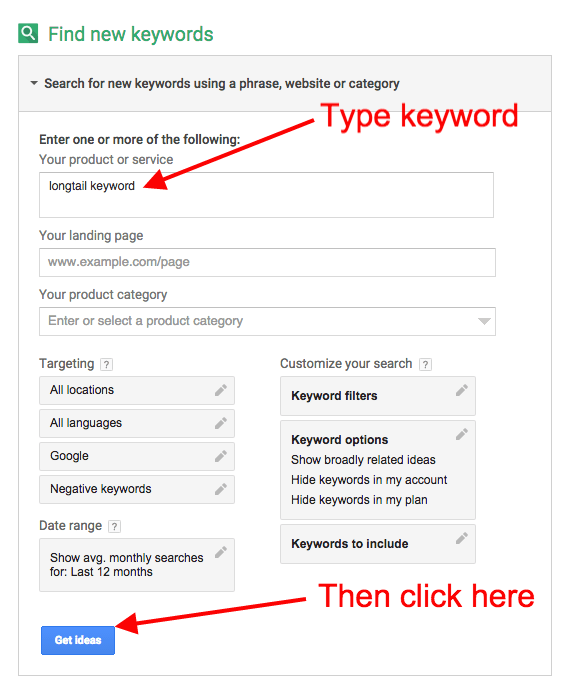 So I recently learned a hack for making keyword research with the Google Keyword Tool a bit more specific. Of course, I wanted to share these tips with you so here we go. Note: You will need a Google account such as a gmail account. If you do not have one, this is a good time to stop and create one. They come in handy for all sorts of digital efforts. Once you are there go ahead and log in. It may automatically log you in and that is fine. You do not have to pay anything to use this tool for research. You should see something similar to the image below when you are logged in. Step 1: Click on "Search for new keywords…." Step 2: Type in a broad keyword such as "long tail keyword or bicycles"
Once you do that you should see something similar to the screenshot below. If you notice there are two tabs just under the bar graph. One tab says Ad group ideas and the other says Keyword ideas. If you scroll down you will see lots and lots of keywords that are related to the one that you typed in. At the bottom right you will notice arrows and you can flip to the next page. Google will give you up to 800 keywords for consideration. That is a lot of keywords to filter through. If you are just getting started with your blog and trying to get some general ideas, this can be good data but it can also be overwhelming. In the future I want to write a series of blog posts about a keyword tool that I recently purchased called Longtail Pro. This is why I am using long tail keyword as my example. 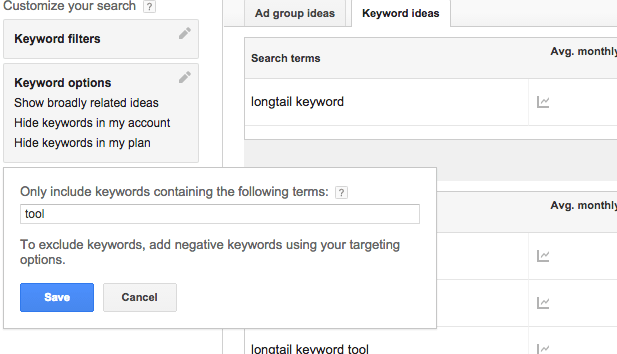 So I want to find out how many people are search about long tail keywords and tool combined. My first search turned up over 700 keywords to sift thru and that is a lot. So I am going to tell Google to give me only keywords that include tool. Step 2: Type in a specific, more narrow word. 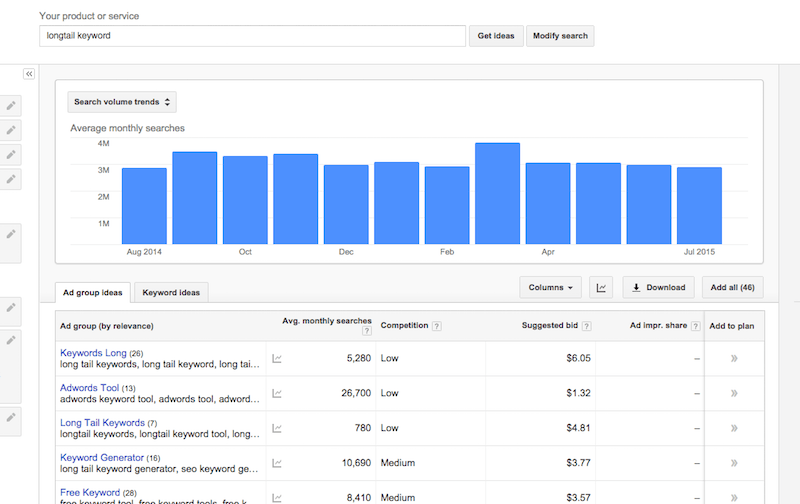 This could be "how to" or "buy" or "review"
When I did this I went from over 700 keywords to 141. That is a far more reasonable number to deal with. The final step that I would do is download these keywords to a spreadsheet so that I can easily analyze them. To download as a spreadsheet just click on the download button as seen in the image below. A few notes to keep in mind after you download your spreadsheet. The competition does not indicate how easy or difficult it will be to get the first page of Google for that keyword phrase. That information is specific to how much it will cost to advertise on Google. The spreadsheet is downloaded as a CSV file. When you open it with Excel, make sure that you save it as an excel file when you close it. When you find a keyword that you think that you would like to write a blog post about, go to Google and see what others are blogging. It is a good idea to see how many blog posts you can find on the topic and get a feel for how competitive you will need to be. 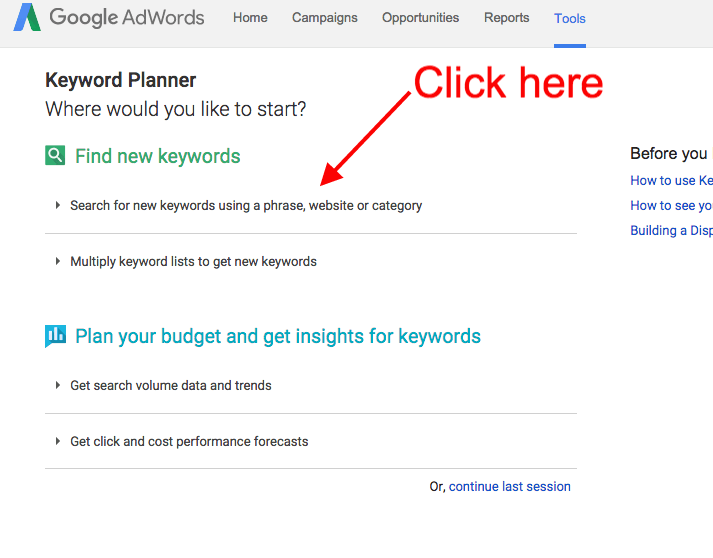 There are tools and calculations that you can do to figure out how difficult it will be to get on the first page for a keyword phrase but for now just pick some keywords. 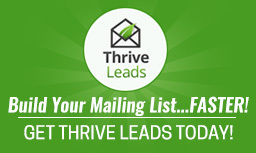 Once you have some and you have looked at your competitors, start writing posts and adding value. If you add enough value around a specific keyword phrase, you will start to be known in your circle for that. Once that happens, the word will spread as will links to your blog.